This morning I was on Breakfast TV Montreal talking about mommy shaming, check out the full segment here. Though, I hate that this blog post even has to exist! 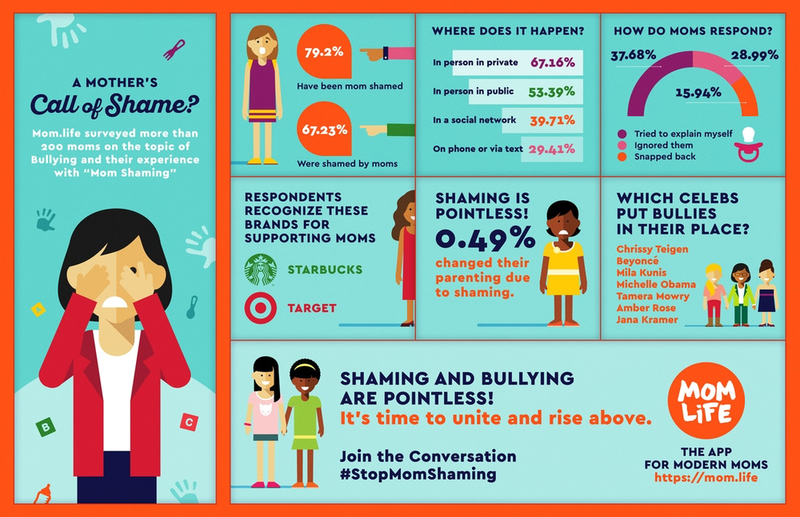 But mom shaming is everywhere, and just about every mom has fallen victim to it. I am no different; I encounter mom shaming at least a few times a week! How sad is that?! How sad is it that it is so darn hard for people to mind their own business, bite their tongue, or just simply realize that we are all human beings trying to do our best. It is so silly that MOMS have to be told not to be bullies. I will admit it; Before I had a baby I on occasion had judgmental thoughts when seeing other peoples parentings. Maybe it's a toddler who is still sucking on a pacifier, a mom feeding her child a not so nutritious snack or even just having the baby out in the cold without a hat. But you know what? I didn't give them a dirty look and I keep my mouth shut! It is not my business and not my place to comment. I know for a fact that not everyone agrees with my parenting technique. Between the comments on social media and the nasty looks I have got while breastfeeding my baby in the middle of a hockey game at the Bell Center, I know some people think I am making the wrong choices. ow, being a mom I do never disapprove of another mothers choices. But I disapprove of moms who publicly judge other moms simply because their lifestyle choices differ. The saying goes, mother knows best, so we need to stop focusing on whose way is best and just do what's best for you. 1. You first need to accept that your definition of what a good mom is may differ from someone else’s. You are not allowed to tell anyone else how to live their life or what should be important to them. 2. Have friends who parent differently than you. It is beneficial to have a diverse group of friends in general. If you have friends who help you think critically about your decisions, you may benefit more and get more out of whatever the situation is....including raising your children. 3. Realize every mom doesn't want to breastfeed and some want to breastfeed for an extended amount of time. Either way, it is none of your business as long as that child is being fed. 4. Realize not every mom wants to stay home. I personally never dreamed of being a stay at home mom. I always saw myself having a career, but life took me down a different path. Even if your intentions are good. The chances are that mom is already beating herself up over a million other things, no need to add to it. 1. I tend to lean on humor in these situations. "I'm sorry you're offended by me breastfeeding, but not by every other billboard with a half naked chick on it." 2. Kill them with kindness. "That is a great suggestion, but I feel good about the way I am doing things." 3. Confront them head on. "I like the choices I am making for my child, and you need to be okay with that. If not our relationship needs to change." Click here to see how celebrity moms deal with the mommy shaming. I don't know what it is, but it seems like we try to one up another parent by making our choices seem better than their choices. This is insane. At the end of the day, we are all human beings just trying to do right by our children and our families. So if you are with your baby every second of every day and you breastfeed them until they are three, then good on you. If you go out sometimes and leave your babe with a babysitter, at a daycare or even a nanny and you are feeding them formula, I hope you feel no guilt, and no one makes you feel bad for that. If you are working multiple jobs to support your family and you don't get to see your precious baby as much as you would like, then you are an amazing human being, and you should be feeling nothing but pride for the life you are providing your child. As women, we need to be empowering, helping, and encouraging one another instead of pulling each other down. It is time to end the mommy wars.